A Minnesota father has officially been charged with murder after his 10-year-old son’s body was found in the Mississippi River over the weekend, KARE-TV reports. 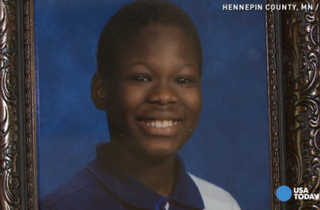 The 33-year-old father, Pierre Collins, is charged with second-degree murder in the death of Barway Collins, although Hennepin County Attorney Mike Freeman believes that there is enough evidence for the father to be indicted for first-degree murder, the news station notes. Collins’ bail was set at $2 million. Barway, who lived in Crystal, went missing on March 18. It would be nearly a month before Boy Scouts, who were helping with the search for the young boy, found his body. When the 10-year-old’s body was retrieved from the river on Saturday, his feet were bound with duct tape and a piece of tape was also wrapped around his torso, KARE-TV notes. An investigation into the young boy’s death showed that his father had two life insurance polices taken out on the young boy. On March 16, two days before Barway went missing, Collins made a payment to a $30,000 life insurance policy before calling the company and asking to have the amount raised to $50,000. Another policy from a different company covers Collins for $100,000 and his dependents for $20,000 each, the news station reports. According to the report, on the day Barway disappeared, Collins attended a child support hearing for children from another relationship. Cellphone records later that morning placed him at the location where Barway’s body was eventually discovered. Collins then returned home, and a few hours later, Barway was seen on a school-bus video returning home at around 4:17 p.m.
Freeman said they have yet to identify the “uncle” the young boy mentioned. The bus dropped Barway off, and he could be seen standing outside. His father’s car was seen in the parking lot and his father was in the car at that time, authorities say. A short while later, Collins’ car left the lot, and his cellphone was again placed in the same location where the body was found before it was turned off. Investigators believe that Collins turned his phone off, only to turn it back on at 5:41 p.m. to tell his wife that the boy was missing. A criminal complaint acknowledges that Collins and his wife have “considerable financial obligations, debt and no current income.” It is noted, however, that Collins was given an offer for a temporary job on March 17, to begin at 4 p.m. the next day. Collins allegedly didn’t take the job, saying that he was unavailable on that day and time.